It’s one of the most obnoxious things in sports, and it’s coming to America. 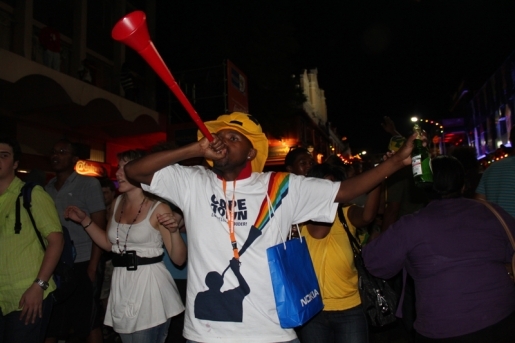 If you’re watching the World Cup, or have even watched highlights of the World Cup, then you know the vuvuzela. That’s that buzzing horn that South Africans love to play at every major or important event. You know, it’s the sound that’s ruining soccer, and now they’ve dediced that it’s time for the vuvuzela to ruin baseball. At a Florida Marlins/Tampa Bay Rays game over the weekend, the first 15,000 fans received vuvuzela-like horns. Hey, Marlins second baseman Dan Uggla! Want to hear the most annoying noise in the world? !